Microsoft Windows Sets – A Browser Revolution? Game Set And Match For Windows 10 With Windows Sets? When Windows 10 arrived, one of the best things about it was Edge, their new browser. After some of the terrible clunkiness of Windows 7 and 8, it really looked like Microsoft had started to listen to the people that used their products, and that they had worked to craft something that added to the experience of its users. Of course, as with any new release there were teething problems – the mail app was godawful, and I haven’t dived back into it to see if it has improved. But “Sets” looks interesting, and is all about increasing the cooperation between apps. It allows you to search from within your word document using tabs, and then you can bundle your documents and your web search into a single file that you can access from anywhere. Not everyone is going to get it as beta feature release, because Microsoft want to assess how much of an impact it has on people’s work, and they piloting the use of their Work In Progress system in a new way that doesn’t just troubleshoot bugs. It may be a long timeline for a full rollout to the public, apparently – possibly taking months or years, which makes sense given how it will affect the use of all the components in Windows 10, but given how the rollouts of Windows 10 regularly break my machine, I might be willing to suffer that for something that actually helps with my workflow. A lot of companies are looking for a higher degree of interoperability between devices and software that their workers use. They also want for people to be able to collaborate in an easy and natural way that does not rely on a complex infrastructure, and which allows for the work to be done irrespective of distance. A lot of almost products are out there, which approach kind of what people need, but don’t quite go far enough. Windows 10, or earlier builds of Windows, are a pretty universal platform for most businesses, so being able to purpose the apps and programs that they are already using for tasks that they have been looking elsewhere to handle is very valuable. People want a one-stop shop. 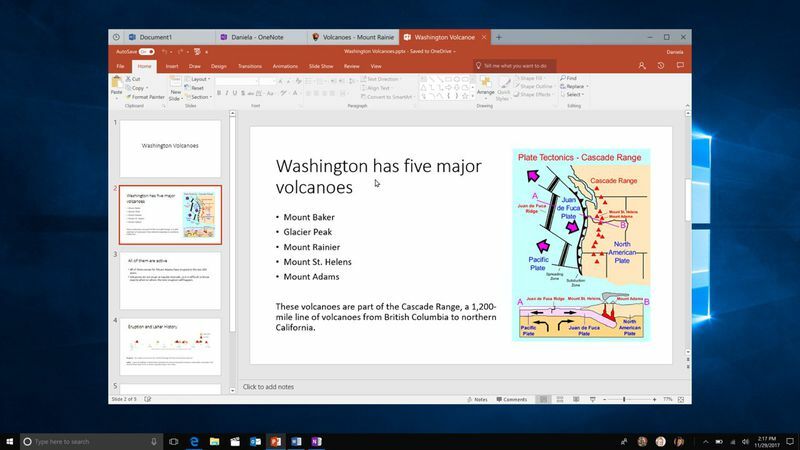 The whole idea behind making Windows 10 a service rather than a product incorporated a notion that it would be more fluid, and perhaps more dynamic, being able to evolve to better serve those who use it. Microsoft now owns LinkedIn, and as part of that purchase it also picked up Lynda.com. Those two sites have become very friendly in terms of the functionality of what you can do on one site and then use on the other site, and if all of their software starts to work in a similar way, it may compensate for how unfriendly Windows is to non-native applications. Microsoft have surely been collecting data on the usage of LinkedIn and Lynda, and processing any comments relating to what people are looking for in the software and maybe even the hardware that they use (see the Moleskine collaboration, and the very successful Surface Pro. Microsoft is still a big player, obviously, but there is the feeling that by not being up on a pedestal, they are somehow freer than other companies like them to experiment. Microsoft may once more become a really interesting venue for innovation, and that really is something that looked unlikely around Windows 7 & 8, two iterations that had people pining for a return to older builds. Obviously they haven’t won everyone over, and the snafus they still make can tank your production on a day where you have to work out what changed, and what needs to be fixed, but these ideas pique the interest, and suggest some great possibilities. Firefox have been making some improvements so they aren’t clunking so much, but they lack the product range that Microsoft has, and therefore the remit of their browser is going to be more limited than Microsoft’s, which can reach into the heart of some programs which are fundamental to your work flow. Flexibility was always the strong point Firefox had in its arsenal, but after a while it become unwieldy. Chrome combined a stripped back dynamism with a similar flexibility, but it’s opening of separate environments for the elements being used in the browser sometimes made your processors struggle. Edge, with this new evolution, might be able to outpace both of these. Edge, working within this new “Sets” framework may also correct what has been frustrating with Windows – that you can’t get things to play nice with each other like you used to be able to. It may roll out incrementally, starting in the email and calendar apps, crinkles being ironed out as it progresses, but the notion of being able to marry up the functionality of programs I use for different tasks has me wishing it would move faster.